Thank you to everyone who attended this year’s live simulcast of Live2Lead in West Des Moines, and to our wonderful sponsors and volunteers who made the event possible! It was an inspiring event with 250 local leaders in attendance. 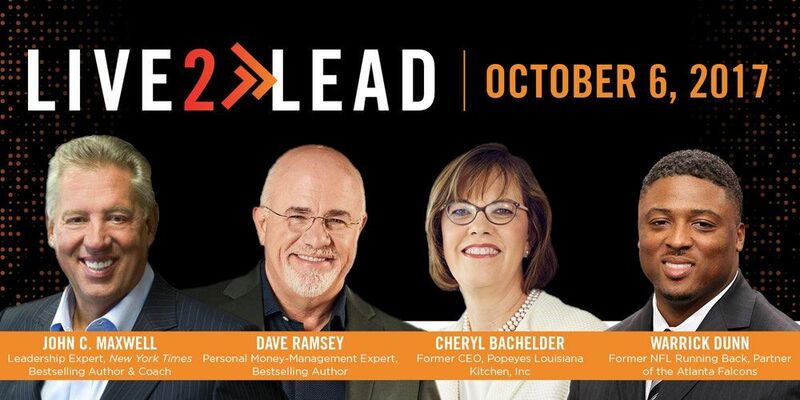 The theme of this year’s conference was “Servant Leadership.” We spent an action-packed half day learning from renowned leaders John C. Maxwell, Dave Ramsey, Cheryl Bachelder and Warrick Dunn. John C. Maxwell shared concepts from the book he is rewriting, “Developing the Leader Within You.” He admitted that he’s changed 89 percent of the book based on the growth he’s experienced in the past 25 years. At L2L, he emphasized that vision is the one indispensable quality of a leader. Know that there is more "MORE" and more "BEFORE." In leadership, there is no finish line. There is always something more to learn and improve upon. Through creativity, leaders can find new answers and solutions questions or problems. With flexibility, leaders know there can be multiple answer and solutions. No matter how good you are right now, you can always be better. While striving to be better, define a process that can help you get there. Maxwell identified the “cycle of success” as: Test -> Fail -> Learn -> Improve -> Re-enter. When you start to ask questions, you stop leading by assumption. One question Maxwell asks other leaders he meets is, “Who do you know that I should know?” By growing your network of influential innovators and asking them questions, you will increase your own understanding. Hope is not a growth strategy – it is something you must work towards. When you set out with the intention of growing every day, you increase your growth capacity. Invest time with people and places that will inspire you. “Every time I’m around a bigger person, when I leave them, I feel bigger myself.” Average people want you to stay average. Surround yourself with the best, and you will be inspired to be better. Dave Ramsey introduced the definition, “EntreLeadership.” A combination of entrepreneur and leadership, he explains how this is the process of leading to cause a venture to grow and prosper. He stated, “organizations are never limited by their opportunity, they are limited by their leaders.” An enterprise will never outgrow its leader but instead, is limited by the leader’s willingness and potential to grow and change. “You are the problem of your own organization. You are also the solution.” He gave an example of two landscaping business owners who came to him on the same day, one who was succeeding and one who just filed for bankruptcy. It was because due to the mindset and the willpower of each company’s leader that one thrived and one failed. He emphasized how all attributes of leadership are a choice. The quirky brilliance of a company’s founder can only take you so far - change is necessary for an organization to thrive. Ramsey also brought up that people aren’t loyal to corporate America because corporate America is not loyal to their people. To be a true leader, you must be a servant. Servant leaders understand and have compassion for employees when they are down, and motivate them to bring their A-game when they are at their best. Great leaders treat others how they want to be treated. Cheryl Bachelder defined servant leadership by asking this question: “Are the people better off because of your leadership?” Through her experience with past bosses, she knew that serving others was the key to superb performance and she used her position as CEO of Popeyes’ Louisiana Kitchen to prove that serving others gets results. They chose a daring destination – “to be the hottest concept in quick service restaurants” – and created a roadmap of goals, strategies and tactics to get there. They chose to serve the franchise owners through love and passion. They treated each franchise owner as a partner, listening to their feedback and pain points and making adjustments to their systems and services. They held themselves accountable for their lofty goals and delivered results. By focusing on the franchise owner’s satisfaction, they drastically improved on sales which served their other key stakeholders in the process. Warrick Dunn, a former NFL running back, three-time Pro Bowl selection, and now part-owner of the Atlanta Falcons, shared lessons learned from his success both on and off the field. Through a question-and-answer format with Dunn, sports journalist Don Yaeger and John C. Maxwell, they spoke about Dunn’s background growing up in a low-income, single-parent household and how he experienced the tragic murder of his mother right as his college football career began to take off. They also shared the strength Dunn found in forgiveness when finally addressing the man who shot his mother, and how he was the first football player who openly talked about depression. Today, he has founded and supports a charity that builds houses for single mothers. His mom was one of his biggest influencers, and the most important lesson learned from her was responsibility. He had to grow up at a young age to help provide for his family, and he learned the importance of following through on commitments and that family always comes first. He spoke on how adversity can be a teaching moment. When faced with adversity, it shouldn’t define you, rather reveal who you truly are. It also prepares you for more difficult moments that may lie ahead in life, giving you the opportunity to change and better yourself. He encourages leaders to constantly seek out opportunities to grow and learn. Constantly ask yourself “how can I do this better?” Surround yourself with smarter people and ask them great questions. Save the date for next year’s L2L conference on October 12th, 2018. I will share more information with you when the event gets closer. Take action with your learnings and implement these key teachings in your daily leadership. For a company rebroadcast of this year’s conference, contact me for details and costs.